This practical new book provides much-needed, practical, hands-on experience capturing analysis and design in UML. It holds the hands of engineers making the difficult leap from developing in C to the higher-level and more robust Unified Modeling Language, thereby supporting professional development for engineers looking to broaden their skill-sets in order to become more saleable in the job market. 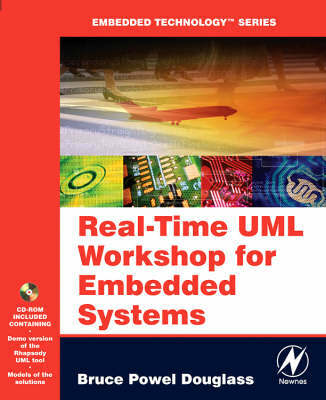 It provides a laboratory environment through a series of progressively more complex exercises that act as building blocks, illustrating the various aspects of UML and its application to real-time and embedded systems. With its focus on gaining proficiency, it goes a significant step beyond basic UML overviews, providing both comprehensive methodology and the best level of supporting exercises available on the market. Each exercise has a matching solution which is thoroughly explained step-by-step in the back of the book. The techniques used to solve these problems come from the author's decades of experience designing and constructing real-time systems. After the exercises have been successfully completed, the book will act as a desk reference for engineers, reminding them of how many of the problems they face in their designs can be solved. It features a tutorial style text with keen focus on in-depth presentation and solution of real-world example problems. It is written by a highly popular, respected and experienced author. The CD includes test version of the popular Rhapsody tool, allowing engineers to capture and work out the exercises in the book.